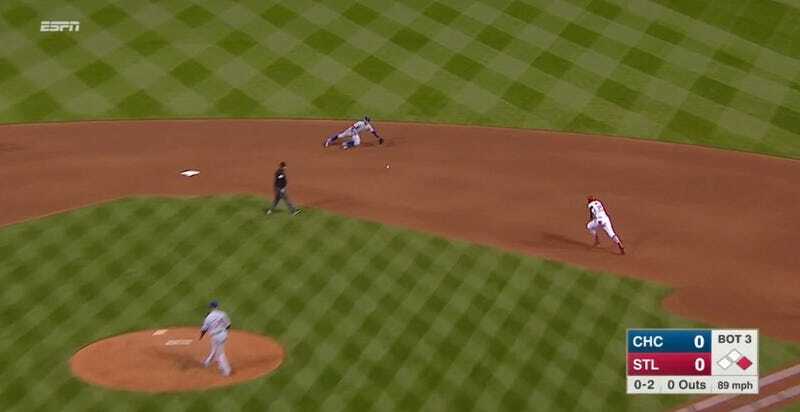 It’s strange to see Cubs super utility man Javier Baez looking uncomfortable on the field, but that’s exactly what happened in the bottom of the third inning of last night’s game between the Cubs and Cardinals. As rare as it is to see a defensive miscue from Baez, it felt like there had to be some other explanation for him failing to get his glove on that ball. Before the start of the next inning, Baez and Cubs manager Joe Maddon offered one: One of the advertising panels along the backstop, a white-backgrounded ad for an MLB app, had prevented Baez from seeing the ball cleanly off the bat. After bringing up the issue with the umpiring crew, the ad was replaced with one that had a blue background. “I’m not afraid to make mistakes. And when I make them, there’s no excuse. I didn’t see the ball at all until it passed the mound. I realize it was the sign because (Diaz) was getting out of the box, and I still couldn’t see the ball. It was only for us playing defense. No excuses. But I couldn’t see the ball off the bat. That moment ended up being a pivotal one in the game. Instead of having nobody on with two outs, Jon Lester had to grind his way through an early two-on, no-out situation. One run scored, and what could have been a quick inning turned into an arduous one. With Lester being chased from the game in the fifth inning and the Cardinals winning by one run, it’s fair to say that dumb ad had a real effect on the outcome of the game. Here’s hoping MLB will wise up and stop putting big, white banners in spots that can prevent fielders from seeing the ball. It’s not like there’s some big mystery here—there’s a reason, after all, why the batter’s eye isn’t white.